This is our first Christmas tree! 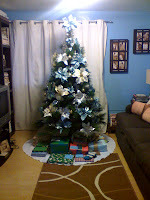 I bought and decorated our tree while Robert was in Beijing. It made me look forward to his homecoming! I made sure the decorations matched the color scheme of our home. I also put little silver picture frames with photos of our family. And most of all, I put lots and lots of presents under the tree!